April is Kids Garden Month! We're celebrating with the KidsGrow contest, and can't wait to see all the amazing things kids will share with us. If you are interested in having the kids in your life participate, ask them to think about what grows in their garden. Creativity is encouraged! You can also ask them to think about what else might grow in their garden that isn't a plant. For example, are they having fun? How does gardening make them feel the food they eat? Do they like to spend time with family, friends, or classmates in the garden? What do they do with the garden's harvest? We created this contest to lift up the powerful and meaningful impact kids have on their community. Gardening can be a springboard to healthier eating, community engagement, and environmental stewardship. These intangible benefits of gardening will last longer than any zucchini or bean you might grow. We so look forward to seeing what's growing in your kids' gardens! You can find all the contest rules and methods of entry on our Kids Garden Month 2019 page. Follow along on our social media accounts (below), and here on the blog, to keep up with all the fun things we're doing this month to celebrate gardening with kids. Pictured above, a poem by a 7-year-old that reads, "In spring the garden's ready. The seeds are planted, we are watering. The wind blows. I sprout." They are really tiny! Paperclip for scale. Many months ago, I shared our office planting experiment - the Prickly Palace! To catch you up, we started growing cactus from seed over a year ago. (Has it been that long?!) Ever so slowly, the cactus keep growing. At least we think they're growing. Honestly, they are so slow that it's hard to tell. But looking back to the image from my blog post ten months ago, they've changed, so that's a good sign. Here's what we've done to help them along since our last post, in case you are looking to try this project in your home or classroom. Our seedlings are in a windowsill. We live in Vermont, and this winter has been very, very cold. So we put a heat mat under the seedlings just to keep them from getting too chilled. We water 2-3 times a week. The soil gets dry really fast with the heat mat on. In the last month or so, we started using some liquid plant food in a spray bottle, and now that's what we use to water each time. The cactus are responding well! It seems like a few of them have grown tiny arms (maybe they are arms, we can't tell what kind of cactus they are yet! ), which is a very exciting development. A particularly odd looking baby cactus. Do you know what it will grow up to be? They aren't yet big enough to move into their own pots, but maybe after a summer of growth we will have some repotting to do. Their pots will be so tiny! Let us know if you have any questions, or even better, some advice! If you've done this before we'd love to hear from you. Last time I blogged, I told you all about the amaryllis I planted with my kids! I’m back with another amaryllis craft, but this one involves a meat mallet. After our amaryllis bloom began to fade, I cut off the stalk. The flower still looked to have some life in it, and I immediately thought of the leaf and flower print activity we added to our website a few months ago. In the middle of winter, you bet your garden spade I’m going to squeeze every last bit of life out of a flower! Hammering with an improvised mallet. The material list for the activity is pretty simple, but I couldn’t find my rubber mallet. I am thinking it’s tucked somewhere in the garage and honestly it was too cold to root around in there hunting for it. So instead I wrapped some wool felt around a meat mallet and let my 7-year old have at it. For the second, she just laid the bloom down and hammered away to see what would happen. Red flowers blooming, but purple pigments printing! Here’s what I found to be most fascinating about this activity – the prints turned out purple! The amaryllis flowers were very bright ruby red. I’m sure there is a fascinating scientific explanation for this. If you have theories - or facts! - of why this happened, please share in the comments. Here’s my review of this activity: I would DEFINITELY do it again. I would, however, use fresh flowers instead of somewhat mushy faded ones. I’d also use a variety of flowers and leaves instead of just one. We’ll repeat this one in the summer when we have more flower to choose from! A wilted amaryllis flower, hammered by a 7-year-old. We are deep into winter here in Vermont, and it’s no surprise that amaryllis bulbs are bringing me great joy in this time of hibernation. I planted them with my kids early in December and our whole family has really been enjoying them! Nary a day goes by that someone doesn’t comment on the bulbs, it’s been a fun, beautiful way to enjoy living plants in this season of ice and snow. Huge bloom! This (now-faded) double flower was bigger than my toddler's head. Confession: I only have one houseplant at home. Our house faces north, and we really don’t get great light. So I was a little unsure how amaryllis would fare, but honestly they are pretty determined plants. I gave one to my daughter’s kindergarten class last year, and it bloomed in their windowless classroom (yes I know that’s so sad). I picked up two amaryllis at my local garden center from the mystery bin. They had probably 20 different types of bulbs at the start of December, each with photos of the blooms. I was immediately drawn to the mystery variety discount bulbs – maybe they rolled out of the bins, and folks didn’t know what kind they were. Since I’ve never seen an ugly amaryllis, I thought it sounded like such a fun way to shop! Kind of like the mystery DumDum lollipops they used to give out at the bank. Real life: Despite rotating and staking, this flower leaned over for most of its life. Still loved it. Amaryllis is really so easy that your kids can do it all themselves! Potting it is simple, and so is watering and rotating the pot to ensure even growth. Of the two we planted in December, one has completed a bloom and is already growing a second flower stalk. The other is a bit poky, and has about a ½ inch of a leaf starting to poke out. It’s not too late to pot one up and have it bloom before spring! Search your local garden center, or scour the interwebs for bulbs. (Gardener’s Supply Company still has a few in stock, for example.) If you’re new to growing amaryllis like me, check out Growing Amaryllis with Kids – I know I’ll be referring to it all year long to keep my current bulbs healthy and blooming year after year. Mister Chris and Friends is a new children's show on Vermont PBS, and KidsGardening's education specialist Christine Gall appears in several episodes as Farmer Christine. She had a fantastic time working on the show, and we are so excited to share it with you. Each new episode of Mister Chris and Friends is designed as an educational lesson on an aspect of the natural world, combined with the show’s foundational approach of creating a safe and welcoming environment in which to learn and explore. The show is incredibly sweet, and if you need to unwind with the littles in your life, you should check it out! May we recommend episode 3, where Christine is the featured guest? Seeds: In this episode, we wish with our friend Wishing Well that we could grow bigger... right now! Mister Chris will work with our farmer friend, Christine, to learn more about what a seed needs to grow, including time. You can watch the entire series at Vermont PBS. Making seed balls with kids is a really fun way to spread wildflower seeds. We tried it out this summer, and I think it would make a really great fall activity, too! Both kids AND adults had fun getting a little messy mixing the seeds into the clay. If you’re doing this activity with toddlers, I recommend using bigger seeds. Or, if you use really tiny seeds, like poppies, you can roll the clay in a few seeds instead of trying to sprinkle them on your clay. We rolled up some seed balls, let them dry for a day, and then set out to spread some beauty. Throwing the seed balls was my kids’ favorite part! We can’t wait to visit again next summer and see what, if anything, has grown. I love cooking with my kids. It's a way for us to spend time together doing something I love. (Not that I don't also love building animal homes with Magna-Tiles and playing The Floor is Lava.) Here are some of the ways my kids and I have been eating and preparing the end-of-season bounty from our garden. One of the best parts of gardening with kids is letting them snack their way through the garden! One of my children claims the only way she likes carrots is if they are freshly-pulled from the garden. Peas, beans, and cherry tomatoes also fall into this category. Sometimes I’m so hesitant to add salt to my kids’ food, because I don’t want them to get accustom to the taste of salty foods. But a little salt makes everything taste better. It will make cucumber slices taste more cucumber-y, and what’s better than a sliced tomato with a wee sprinkling of salt? It could also be a fun taste test experiment - try one cucumber with a tiny bit of salt, and one without, and make notes on the difference. It’s not just for basil anymore! Yes, basil pesto is amazing, and if you live in a cooler climate, you’re probably stocking your freezer with it right now. But if your kids dig basil pesto, try some others as well. Kale pesto is fantastic. (I've been heaping kale pesto on pan-roasted chickpeas and pasta for dinner more times than I care to admit.) Carrot top pesto, garlic scape pesto, spinach pesto, vegan, nut-free, the sky’s the limit on pesto variations. Bonus: kids love pushing buttons on the blender or food-processor! When in doubt, pickle it. Refrigerator pickles are great for kids (and grown-ups) because you don’t have to mess with a hot-water bath, and you can eat them later the same day as opposed to waiting a few weeks. They can help chop up the vegetables (I have one of these wavy choppers, and it's great for making your pickles look fancy and for kiddo helpers), measure out spices and vinegar for the brine, and stuff the vegetables into jars. You should probably do the boiling and maybe the hot-liquid pouring. You can quick-pickle pretty much anything. Some of my favorites are: cucumbers, onions, carrots, beans, fennel, even cherry tomatoes! What are you cooking with your kids? I love hearing new ideas! One of the great things about gardening – of which there are many! – are the stories you can tell. Kids always have great garden stories; from accidentally eating a slug on a piece of kale, to the time a groundhog devoured all the snap peas. This last one actually led to a 5-minute dramatic production put on by my daughter’s preschool class. The other day my daughter and I were happily hunting for ripe cherry tomatoes when I noticed that one of my tomato plants was growing only stems, but no leaves. Later that night, it hit me. My plant isn’t growing only stems, something is eating the leaves! I had it in my head what it could be, and checked the KidsGardening growing guide and another gardening book to be sure. Yep. It’s a hornworm. The black droppings of a hornworm. But I didn’t find the hornworm. I am hopeful that the crows that had been eating the strawberries flew by and enjoyed a tasty hornworm snack. If so, I may forgive the crows. Telling stories about garden foes, funny incidents, or gross encounters connects the garden to your family or school's history. It can connect you, as an adult, to fellow gardeners who may have advice or whoppers of their own to add. If your kids are like mine, they want to hear the same stories over and over again. (Mayyyybe I use this opportunity to embellish the story a wee bit and really draw out the suspense.) So, tell us, what's the garden story you've been telling around the watering hose this summer? The other day, my colleague Sarah asked how my kids were liking gardening this summer. Eek. Confession time: I haven’t taken them to our community garden plot much at all this summer. I have a huge list of reasons: it’s been boiling hot (for Vermont), I’ve been enjoying the peaceful alone time, and since I always feel “behind” on gardening, I feel like I don’t have the extra time to take them along. Oh, and maybe the most important reason: crows have been eating our strawberries! Wildlife is eating my best garden bribes! They have been eating produce from our plot. I have been able to bring home some kale, and they claim that our garden kale is the best on planet Earth. One kid was so excited about the first garden snow pea she saved it to show her friends at art camp. They have been helping garden at home a bit. We have a few low-to-no maintenance flower beds that they like to help water. They both help manage the weeds. They monitor our rudbeckia for aphids. (None yet!) They let us know the score of the lilies vs. lily leaf beetles matchup. (Honestly, it’s kind of a tie game at this point.) They LOVE to help fill up our Oya. I’m resolving (publicly!) to do better. Maybe now that we’re moving into harvest season it will be a little easier to bring them to our plot. As I mentioned, our peas have finally come in, so while the strawberries recover under some bird netting, I have some other snackable bribes. And the zinnias are almost blooming, and who doesn’t love to bring home flowers?! I’m not going to force it, though. I’ll invite them to come (perhaps with a little bribery), and offer a wagon ride. But if it becomes a too-hot, too-buggy, “stop touching the neighbor’s tomatoes!” chore, then I’m ok just bringing home the fresh foods for them to snack on in the front yard and at the dinner table. A few months ago, while we were starting pepper, eggplant, and tomato seeds, my 6-year old really wanted to plant an apple seed. She said she wanted to grow an apple tree to plant in our community garden so she could eat apples anytime she wanted. 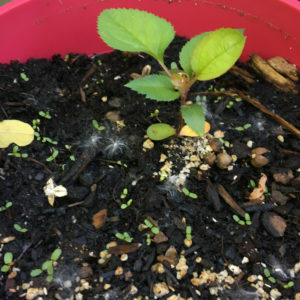 I delayed her a few times, because I knew that 1) the seed wouldn’t germinate and 2) it wouldn’t just sprout a tree that would produce apples within six months. Well, when we were starting a second round of plants this winter, she found an apple seed she had covertly saved from a few days back and asked if I could save a seed-starting cell for her apple tree. So she stuck it in some seed starting mix. And whaddayaknow, it sprouted within a week. I was shocked. Everything I’ve read about starting apples from seed says it’s not the best idea because 1) you don’t know what type of apples it will actually produce and 2) there is an elaborate process of scoring the seed, cold storage for several weeks or months, then planting in specific conditions. She doesn't care which apple variety she produces, and did none of the horticultural requirements for success. Her little apple seedling did great under the grow lights, and has since been transplanted to a magenta pot outside. The plan is to let it get bigger this year, and then plant it in a family member’s orchard next spring. If the apple tree survives long enough to produce apples – we know nothing of tending apple seedlings – it will be nothing short of a miracle. Why was I so hesitant to plant the apple seed? A seed failing to germinate wasn’t going to send my kid into a tailspin of disappointment. And we could always try again. I like to think that I encourage my kids to take reasonable risks. Usually I think of this as physical risks – jumping from stumps, hanging upside down on the monkey bars, or learning to use a carving knife. But taking educational risks are maybe even more important (and less likely to require stitches). This was a time where I failed at encouraging reasonable risk taking. (Luckily I was saved by my child’s persistence.) It’s ok to fail. It’s ok to have a science experiment fizzle instead of pop. It’s ok to have a vegetable fail to produce in the garden. Sometimes you can follow all of the rules and advice, and still not be successful. It's ok to have it be about the journey rather than the destination.